My friend, Rowdy, hit the nail on the head during a recent conversation. She mentioned loving old homes and castles and was hoping to get to Versailles. Since that didn't work for her schedule this year, her husband suggested a trip to The Biltmore instead. It's almost comical when a home in the random, out-of-the-way town of Asheville, North Carolina, comes in second to one of the most magnficient palaces in the world. (Although, since I hate Paris, I'd be content to never go back there again. Peterhof in St. Petersburg, Russia, was just as cool!) 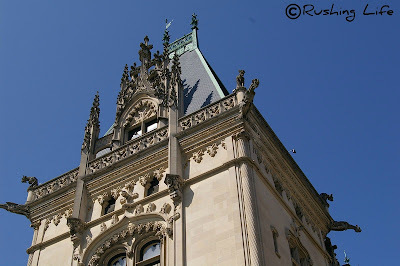 But the truth is, The Biltmore Estate is awesome. I hate to repeat visits to places, even The Biltmore, but thankfully, the few times I have been have been spread out far enough, and in different seasons, so it was never a chore. Plus, new places to explore like the farm and the vineyard and winery always seem to pop up. This photo was from a trip there with my parents in 2009. It was the second time they had met Puff and I was happy they still approved. I love the Biltmore! Steven and I went there years ago and I still rave about it to people. It felt like Europe in the States! Way cool! !